Recognised for his great designs, Peter Maly is one of the most important European designers. In 1970, Maly established his own design studio in Hamburg, and since then his designs have been manufactured by the most important European furniture manufacturers. Characteristics of Maly’s work are the linear and geometric forms. His designs are commonly described as pure, functional and always up to date in terms of style. Peter Maly has obtained prestigious awards all over the world and, in 1998, the second edition of the book "Designermonographie 5 – Peter Maly" has been printed. 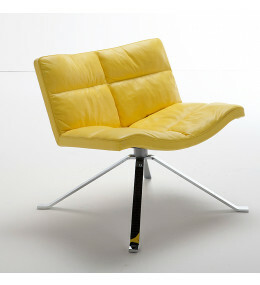 Wave Soft Lounge Chair is offered with square or spider base; fixed or swivel options on both with memory return.